I have been asked many times the question “do you like spicy foods?” I always answer in the affirmative. I mean, I’m not a huge fan of “burn your tongue” nor am I the guy who wanders the aisles of the food market searching for the hottest sauce but, overall, I like a little “heat” now and then. 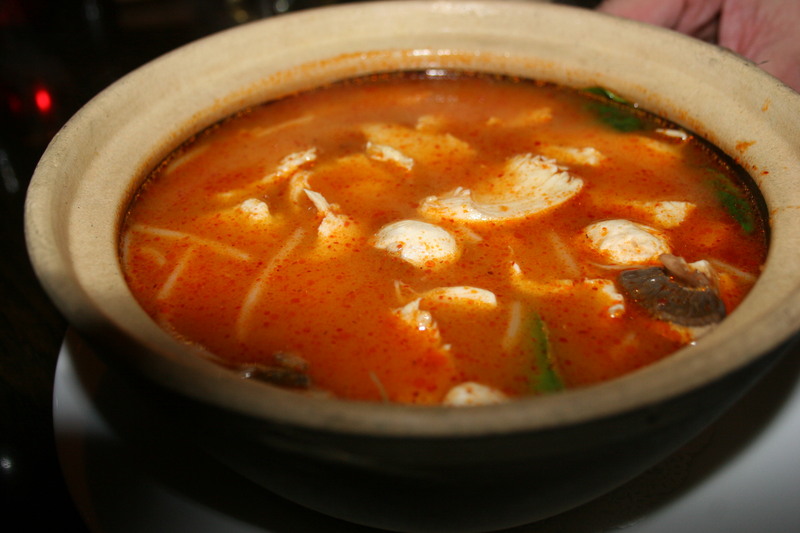 Saturday evening, at Thai Basil in Collingswood, NJ, I was forced to rethink my position on the whole spicy food thing. Six of us enjoyed a rare round table at this Haddon Avenue restaurant. I had a terrific bottle of wine with me this night. 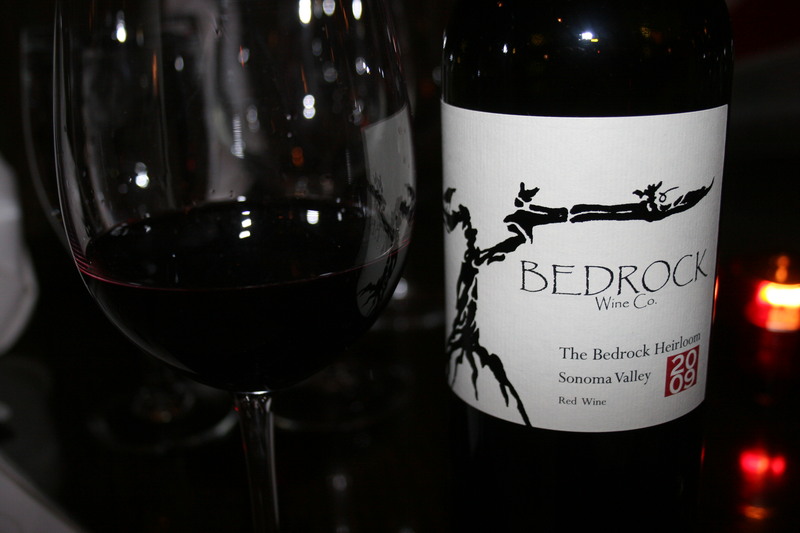 The 2009 Bedrock Heirloom, Sonoma Valley. This one is a zinfandel blend with 19 different varieties of red grapes made by Morgan Twain Peterson, a true artist when it comes to creating wines (he’s been doing it since he was five years old). Great nose on this one, soft lavender scents, red licorice and peppery spices and then just an elegant mouthfeel and a long seductive finish. I was actually surprised to find that Thai Basil has some pretty nice wine stems. Maybe, the best I have seen in all of Collingswood. This was Jerry’s appetizer, and it probably should have been mine, the Bangkok Shu Mai (like I’m telling you something you don’t already know). 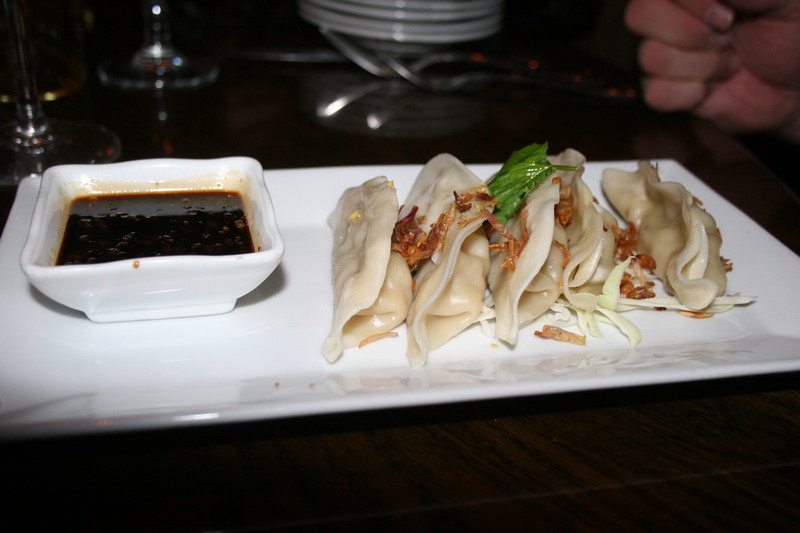 Steamed dumplings filled with minced crab meat, chicken and jicama served with chili garlic soy sauce. I had a piece of one and it was excellent. 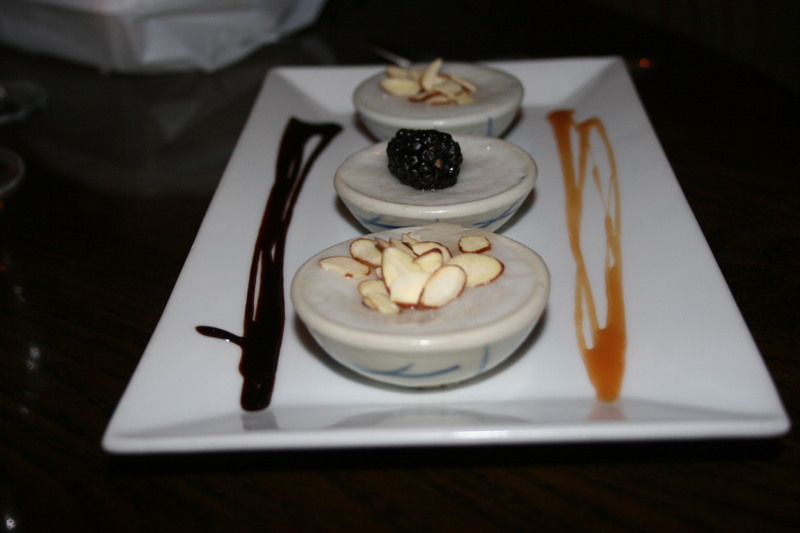 Carol and Joe split the Thai Basil Treasure, an Asian version of the “Sampler”. The dish contained some Chicken Satay (another item that I could have safely chosen), vegetable spring rolls, several of the aforementioned Bangkok Shu Mai and some Thai Chicken Curry puffs. I have absolutely nothing good to say about the chicken curry puffs, suffice to say that Joe told me to feel free to have as many of them as I wished. 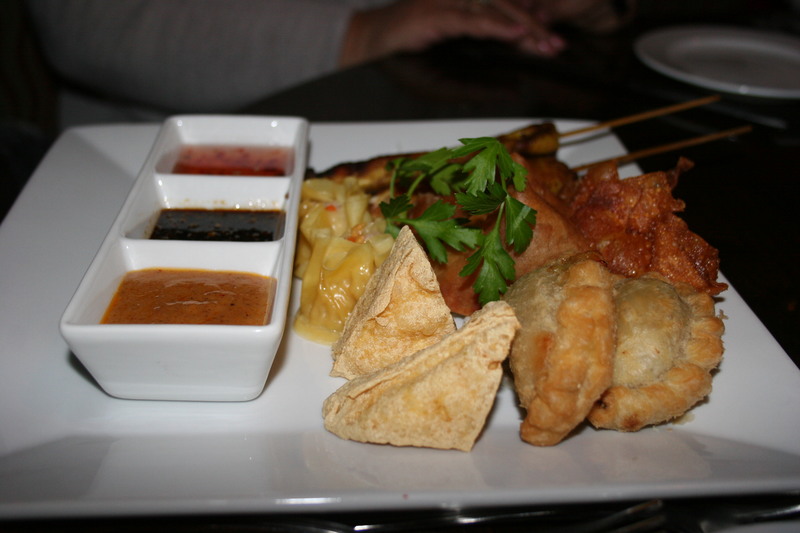 The appetizer was served with three different dipping sauces, none of which helped redeem the chicken curry puffs. This innocent looking plate on the left was my choice to start off my meal. It’s the Crying Tiger. It could also be called, the Crying Blogger. I just went to look it up again on the menu. I had been totally convinced that it had two “red peppers” next to it on the menu which I took to mean, “a little hotter than normal”. I now find it has only ONE red pepper which must make me the biggest “wuss” in all of South Jersey. 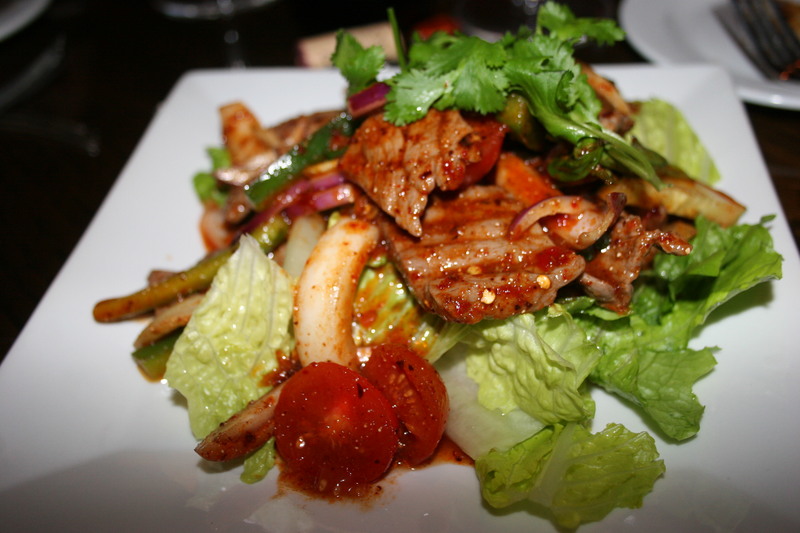 It is described as Northeast Thailand grilled steak, tossed with shallot, bell pepper, ground roasted sticky rice in a spicy lime dressing. I saw no sticky rice and unfortunately for me, the dressing not only cleared my sinuses and resulted in my draining several water glasses, but killed the taste of my wine for a good part of the evening. I was proud of myself though as I refrained from asking my dinner companions to dial 911. 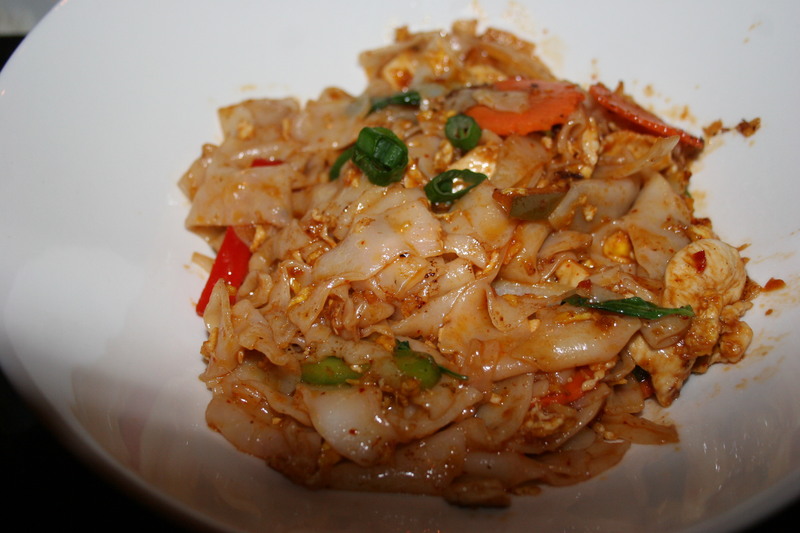 My entree selection, was the Chicken in Drunken Noodles which I’m sure most of you know as the Pad Key Maow. Once the paramedics doused the flame in my mouth I was ready to attack this slightly tamer version of a culinary blast furnace. This one was actually pretty good. Wok-fried flat noodles, Julienne bell peppers, onion, carrot and sweet fresh basil in a roasted chili paste. This one, which was far tamer than the Crying Tiger actually has TWO “red peppers” on the menu. I really think a Congressional investigation is called for to sort out the accuracy of the Thai Basil menu. Jerry ordered the Thai Basil Tom Yom Noodle Soup with chicken, hold the cilantro, from the Meal In A Pot section of the menu. This was also a two “red pepper” dish but he had no trouble with it and enjoyed his entire meal. I took two pictures of Sue’s dish but neither one is good enough to post. 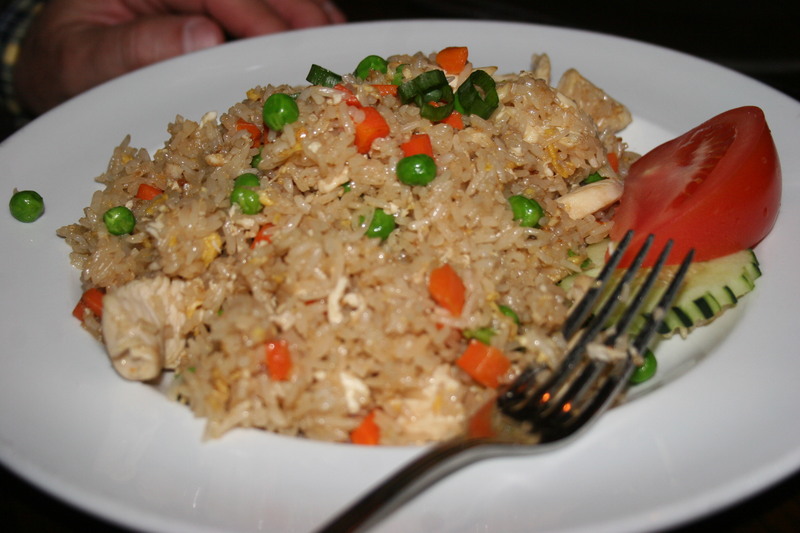 My wife, Kathy, Joe and Carol each had some variation of Chicken Fried Rice. I believe Carol had pineapple in hers. She thought the dish was a bit dry and our server brought some soy sauce to give it a little wetness. We all had just enough room for dessert and we chose either ice cream (Kathy had the Ginger flavor, I had the Coconut and Carol had the Green Tea). 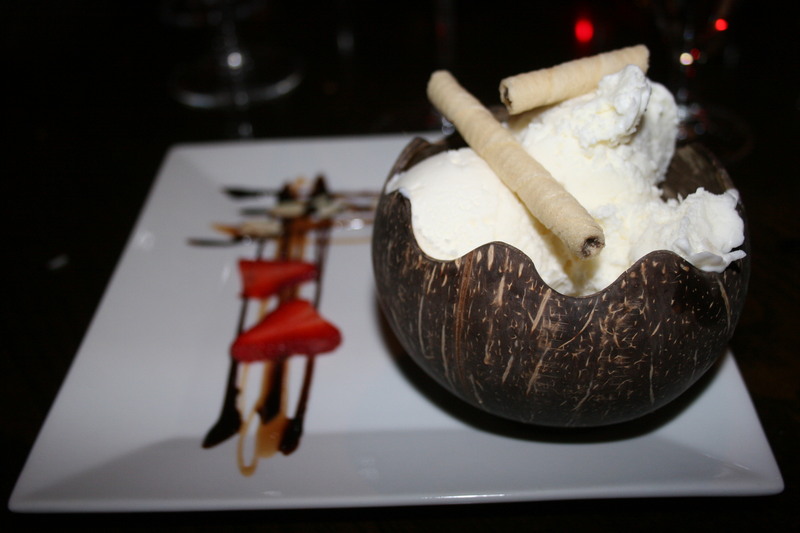 Jerry went with the Coconut Pudding and I thought they were all a nice ending to the meal. 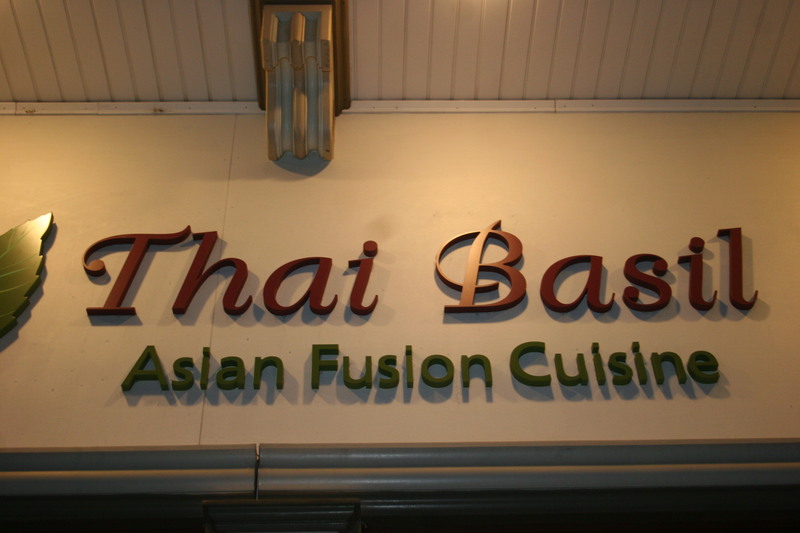 Please don’t judge Thai Basil by my review. Those of you who are a bit tougher than I may have no problem with the “minor heat” that had tears running from my nose and my eyes. Beware the CRYING TIGER!